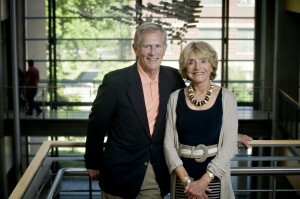 Life has been good to OSU alumni Mike and Judy Gaulke. So when it came time to determine how they would share their good fortune, they chose the institutions that had been meaningful in their lives, and topping the list was Oregon State University. The Gaulkes have pledged $3.5 million to create the Michael and Judith Gaulke Chair of Electrical Engineering and Computer Science at OSU. This endowed faculty position fund is the largest to date for the College of Engineering. The inaugural chair will be awarded to OSU electrical engineering professor John Wager, an award-winning teacher and dedicated researcher. “I am honored to hold this title, and grateful for the generous support of the Gaulkes,” says Wager, who is internationally recognized for his leading role in the development of transparent electronics, a technology that is being incorporated into the iPad3™. The Gaulkes’ gift leverages the OSU Provost’s Faculty Match Program, which provides an additional $450,000 over five years for the College of Engineering. With this gift and matching funds, the school plans on adding an additional faculty position focused on sensor technology research and teaching. Mike graduated from the College of Engineering in 1968 and went to work for Procter & Gamble. In 1972 he earned an MBA at the Stanford Graduate School of Business and joined McKinsey & Company as a management consultant. He held executive positions with Spectra Physics, Inc., and Raynet Corporation before joining Exponent, Inc., a leading engineering and consulting firm that performs in-depth investigations of accidents and failures to determine their causes. The collapse of the World Trade Center, silicon breast implants, computer battery recalls, and Hurricane Katrina are examples of some of the 5000+ projects per year worked on by Exponent. Mike retired from Exponent after spending 18 years with the firm, including 13 as its CEO. He remains Chairman of its board. OSU’s College of Engineering inducted Mike into the Engineering Hall of Fame in 2008. Judy, formerly Judy Mellenthin, now a successful artist, also credits OSU for launching her career. In 1965, Judy’s senior year, Pan American Airways visited campus to recruit flight attendants. Judy spent four years flying around the world, visiting 86 countries. But it was her home economics degree that landed her a job as the cookbook editor at Sunset Magazine, where she wrote 16 cookbooks. She went on to be the director of new restaurant concepts for a large restaurant corporation and then became a successful food stylist, before returning to her true calling as an artist. The Gaulkes both grew up in Hood River, Ore. Judy’s father, an OSU professor in pomology horticulture, ran the Hood River horticultural experiment station. “I was a Beaver born and a Beaver bred,” says Judy. Today the Gaulkes live in Atherton, Calif. Both are pilots and enjoy traveling. Their most recent adventure was a motorcycle trip through the Alps. Mike, ever the engineer, has taken apart and rebuilt things all his life – Heathkit radios as kid, a Vespa scooter as an adolescent, motorcycles and cars as an adult. His most recent project is a racecar, painted, of course, Beaver orange, black, and white.